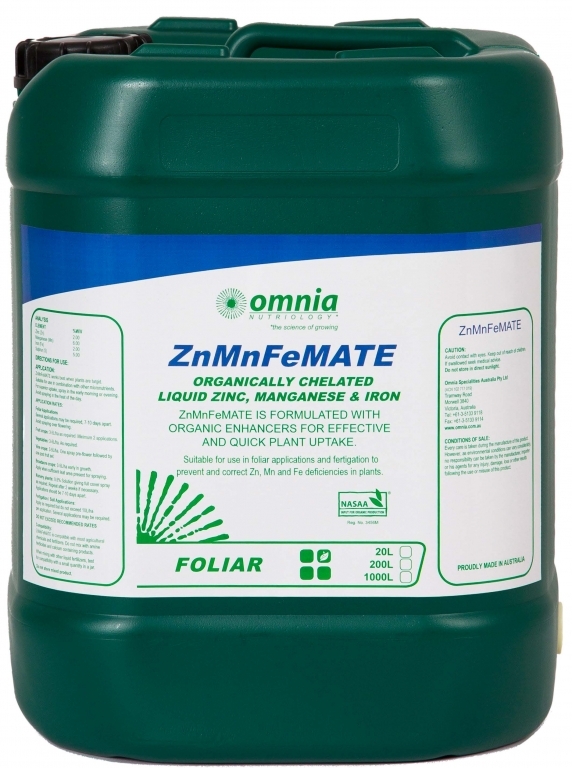 ZnMnFeMate is formulated with organic enhancers for effective and quick plant uptake. Deficiencies in these micro-element can have detrimental reductions in yield and quality of the crop. With OmniSap testing this situation can be identified and effectively alleviated with ZnMnFeMate. Effective alleviation of Zinc, Manganese and Iron deficiencies. Do not exceed a 1% solution in high volume sprays and no more than 3% concentration in low volume sprays under 50L/ha. 3.0 – 5.0 litres/ha as required. Minimum two applications. 3.0 – 5.0 litres/ha as required. 3.0 – 5.0 litres/ha. One spray pre-flower followed by one post fruit set. 3.0 – 5.0 litres/ha early in growth. Apply when sufficient leaf area present for spraying. 0.5% Solution giving full cover spray as required. ZnMnFeMate is a NASAA-Certified organic product of choice.